This program from the City Life series is set in Lebanon, where (according to the UN) there are three hundred seventy-five thousand Palestinian refugees. Palestinians are unwanted in Israel, but in war-torn, sectarian Lebanon, among fellow Arabs, they hardly fare better, and most live in poverty. Barred from working, they also have limited access to medical care and higher education. 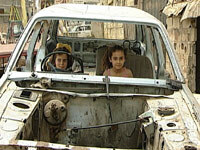 Many have been in Lebanon for over fifty years. A Palestinian doctor working in the PLO-funded Haifa hospital in Burj el Barajneh refugee camp, Beirut, earns US $200 month, and is glad of the work: she's forbidden in any Lebanese hospital. Elsewhere young Palestinians do not value education because they see their parents in menial, part-time jobs regardless of their qualifications. For refugees living in South Lebanon, a degree qualifies a person to pick oranges, at a salary of US $6.30 a day. South Lebanon's refugees are even prohibited from rebuilding their houses. Those who can get out of Lebanon go to Europe, Canada, or the USA -- but they never give up hope of returning to their villages in Palestine. Adding insult to injury, a recent law enacted in Lebanon prohibits Palestinians from owning property -- though people from any other recognized state have that right. But Palestinians do not have a state: they are officially stateless. The producer of this program has collected extensive resources at www.tve.org/lifeonline/index.cfm?aid=1125.